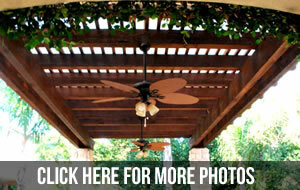 Pergolas, one of the most iconic patio designs, have seen a continuous rise in popularity. Because of its diverse utility, a well-built pergola can easily stand the test of time. Also known as an arbor or open gazebo, a pergola consists of a latticed roof supported by sturdy crossbeams. Whether it becomes a standalone focal point for your yard or a shade provider for your garden, pergolas have quickly become a popular outdoor feature for many homes. Whichever purpose it serves, a pergola will not only increase the aesthetic value but will also increase the property value of your home. If you’re interested in adding a pergola to your home, call Patio Creations today and explore the multitude of design options for your pergola installation. You can also schedule a free in-home consultation so that our experts can walk your property and discuss the possibilities for your home.